Ndamukong Suh is an American professional Football Player who plays in the National Football League (NFL). 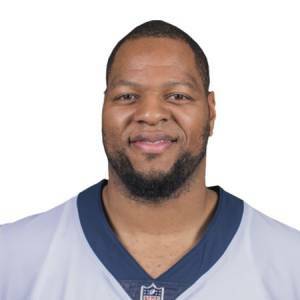 As of 2019, Ndamukong Suh currently plays for the Los Angeles Rams as their nose tackle. Ndamukong Suh has played for other teams like Detroit Lions and Miami Dolphins previously. As a nose tackle, Ndamukong Suh reportedly earns around $14,000,000 as his yearly salary from Los Angeles Rams. Further, Ndamukong Suh has an estimated net worth of over $70 million. Further, he is rumored to be dating his girlfriend Katya Leick. Ndamukong Suh was born on January 6, 1987, in Portland, Oregon to parents Michael Suh and Bernadette Lennon Suh. As per his nationality, he is American and belongs to White ethnic group. Further, his star sign is Capricorn. He grew up along with his sibling, Odette Lennon Ngum Suh. He played college football at Nebraska, earning All-American honors. As a senior, Suh became one of the most decorated players in the history of college football. He has received numerous awards including the Associated Press College Football Player of the Year, the Bronko Nagurski Trophy, the Chuck Bednarik Award, the Lombardi Award, and the Outland Trophy. As of 2019, Ndamukong Suh has an estimated net worth of over $70 million. He reportedly signed a 1 year, $14,000,000 contract with Los Angeles Rams in 2018. Further, the NFL player has an average salary of $14,000,000 annually. Additionally, Ndamukong Suh so far has made earnings of $138,715,157 from his entire NFL career. In 2015, Ndamukong Suh signed one of the biggest contracts in the history of NFL and agreed to join the Miami Dolphins in a deal worth $114 million over six years, $60 million guaranteed. The NFL Player Ndamukong Suh earns a good amount of money from various sponsorships. He reportedly earns over $0.4 million in a year from different sponsors. Moreover, he ranked #16 in the list of The World's Highest-Paid Athletes 2015 published by Forbes while Floyd Mayweather led the list. 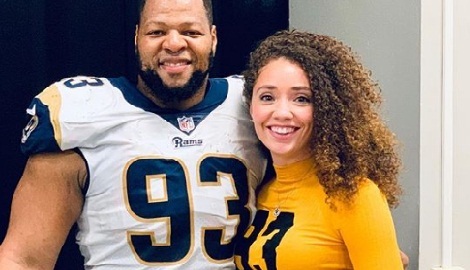 Ndamukong Suh is dating his girlfriend Katya Leick since the end of 2017. The two met in Miami during Suh's stomping days for the Dolphins. Katya is an Instagram model and former college basketball player. Katya played for years for Kansas State. His girlfriend Katya appears in almost all of his game cheering him wearing No.93 jersey with Suh’s name emblazoned on the back. Talking about his body measurement, the Famous NFL star is 6 ft 4 in (1.93 m) in height and weighs around 142 kg. In the 2010 NFL Draft, he was drafted by the Detroit Lions second overall. Suh was widely regarded as one of the best available prospects in the draft. The draft analyst of ESPN.com, Mel Kiper, Jr., described Suh as "perhaps the most dominant defensive tackle I've seen in 32 years" and projected him to be #1 overall in future. After agreeing on a contract with Detroit Lions on August 3, Suh had his first sack against Chicago Bears quarterback Jay Cutler just after 9 days of professional contract. Additionally, he played for Detroit Lions for 4 years, winning many awards and honors. On 11 March 2015, the Miami Dolphins announced their signing of Suh. During a match against the Washington Redskins on September 13, 2015, when Alfred Morris was still lying on the ground after a tackle by Redskins, Suh seemed to knock Morris's helmet off with his leg. Later, on 26 March 2018, Suh signed a one- year $14 million contract with Los Angeles Rams.